Vinyl lettering, also known as "true decals" are a great, cost effective way to add signage or design to any smooth surface. Frequently this material is used in crafts, DIY projects, and home and office decor. The problem with vinyl lettering and true decals is customers are often limited in which fonts and colors can be used. Most vinyl signage companies can only used specific fonts or work with coloured vinyl sheets. This means that your vinyl decals are all one colour. If you are using decals in an office environment or for branding purposes, it can be difficult to match to your existing style. 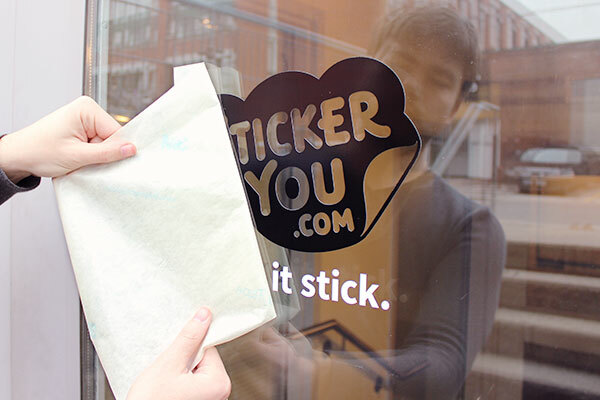 Enter StickerYou. Vinyl lettering and true decals are the most recent edition to our product line, and like with all of our other custom sticker and label products, we strive to offer full customization. We print on white vinyl, so you can choose any combination of colours you need to match any branding or company colours. We also allow you to use your own designs which includes any fonts you wish. Available in any size. These vinyl decals are applied with a backing and a masking. The backing is peeled off revealing the adhesive side of the decal. The decal is then applied to a smooth surface and then and even pressure is applied to squeeze out any bubbles. Then the masking is gently peeled off the decals, leaving your true decals in place on the surface. Works best on glass and walls but will also adhere well to walls, vehicles and any other smooth surfaces. Get a quote for your completely custom vinyl lettering or true decal. We'll be happy to get started n your order.